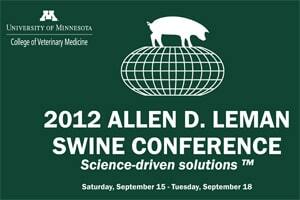 UMASH had a strong presence at the Allen D. Leman Swine Conference at the St. Paul River Center on September 16-17, 2013. Peter Davies, Project Director presented a Keynote Lecture on “Livestock Associated MRSA: Tiger or Pussycat?” and Bruce Alexander and Jeff Bender, Center Directors, participated in an Occupational Safety workshop presenting “Worker Health and Safety in Animal Agriculture”. Joni Sheftel, Project Director, participated in a workshop on Influenza & the Human-Animal Interface presenting “Swine influenza: The human and animal interface at Minnesota fairs and live animal markets”. Outreach staff hosted a UMASH booth with resources such as Needlestick Prevention fact sheets available to all attendees.